A good indication of how popular a niche is becoming, is looking for big companies to adapt that niche. Even though eSports can hardly be called a niche anymore, the uprising of worldwide mainstream popularity is still relatively young. Today one of the biggest companies of worldwide mainstream culture is opening up to all developers to broadcast their games Live. Yes, we are talking about Facebook! So should we all go to our Facebook accounts and watch the Overwatch League there from now on? The surprising answer is; you could. 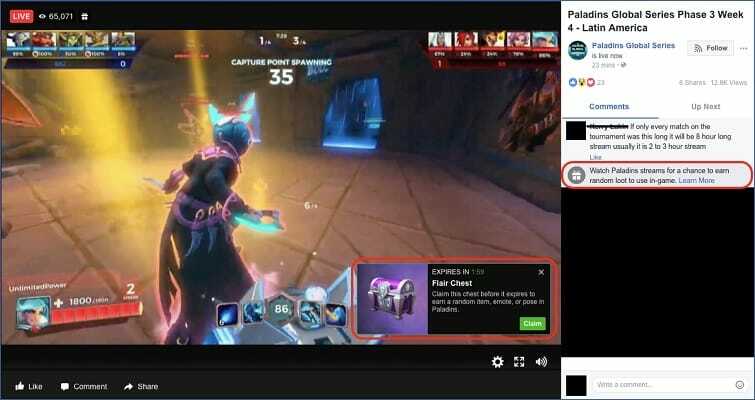 The clever heads of Facebook figured that their platform offers something to streamers that Twitch for instance does not: a ready audience. If you are tired of streaming for 2 viewers, switching to Facebook seems like a good step since that platform comes with 100, 200, 300 or a 1000 virtual friends ready to watch. So instead of luring streamers with benefits, Facebook figured, we lure viewers. Though the audience might not be as dedicated to gaming as the traditional channels, there is a potential of a lot more viewers. Maybe a whole new audience that is about to discover the excitement of watching streams. Facebook in turn gets to hold visitors on their platform for a long duration of time, which opens up possibilities for advertisement. But the Facebook algorithm opens up a lot more opportunities for streamers, viewers and developers alike. For example, Facebook already has a well developed analytics tool that can be used to reach potential viewers. And there is an existing friend finder that can simply be enhanced by adding games as a parameter. Though Facebook is kinda late to the party, the massive funds to their exposal make that they can enter this party like a rockstar and have some heads turning. Already they are making deals with CS:GO and DOTA tournaments about the broadcast rights. And a ‘tipping tool’ is currently experimented with. Streaming on Facebook means people open up about their love of gaming. Question is if the world is ready to really accept gamers for who they are. Until now people went to designated, anonymous places like Twitch of the corners of Youtube to show off their skills. It’s a paradox of Facebook being late on the scene, but on the other hand maybe being to early. Could it be they found the momentum and we will all be watching streams on Facebook from now on? We can’t wait to find out! Previous Previous post: Fortnite is rising in popularity. How is Blizzard gonna react? Next Next post: Make sure to place a bet on these all female teams!